A top adviser to President Donald Trump indicated Sunday that Trump is prepared to issue the first veto of his term if Congress votes to disapprove of his declaration of a national emergency along the U.S.-Mexico border. Trump declared the emergency Friday in an effort to go around Congress to fund his border wall. It would allow him to move federal dollars earmarked for military construction to the border  but is already facing legal and political challenges. The go-around lie is still being pushed. If an invasion of America by armies (”caravans”) of foreign freeloaders isn’t an emergency, I don’t know what is. I knew this was going to happen when the far left politicians started legalizing drugs for “recreational” use. Defending the citizens of the republic is now fascism. If you dont let illegal immigrants invade your country - youre a fascist. If you dont submit to communism youre a fascist. If you dont turn over your guns to prove you wont be violent - youre a fascist. If you actually use the banks and commerce to silence opposing viewpoints to communism youre stopping bullying. If you use threats of violence (Maxine, Obama, antifa, Hillary, Pelosi) and actually shoot republicans, youre a hero. If you use social media to silence conservatives, youre aiding the cause. If you villify Pres Trump and his followers in Hollywood, you get an award. FNC? I’m waiting for what the big fella has to say. 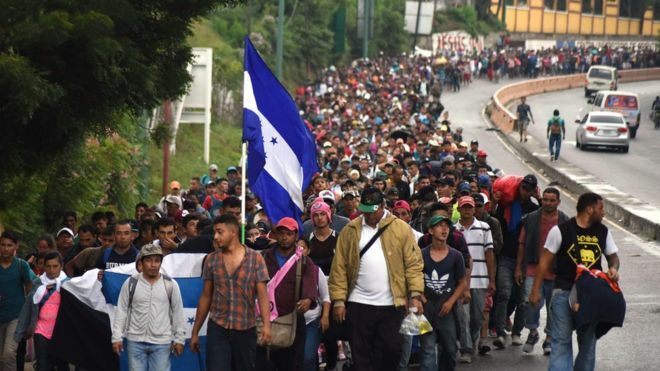 hat tip FlingWingFlyer: If armies (caravans) of foreign onvaders and freeloaders isnt an emergency, I dont know what is. I knew this was going to happen when the far left politicians started legalizing drugs for recreational use. (HAT TIP sara barracuda) Democrats will fight to the death to prevent a wall; they need illegal voters for their very survival as a party. MILLIONS of illegal aliens pouring into our country is NO emergency to them; it means more Democrap power over us. "Pelosi and Schumer gave us directions to electoral college states." "We're already registered to vote Democrat." I don't understand... what is there to veto? If this is simply a resolution that doesn't pass any legislation, then what purpose does a veto serve? Congress doing what it does best nothing and getting paid to do it. Why does the GOP have a political death wish? What a sad way for the Party of Lincoln to die. “”I don’t understand... what is there to veto? Sure glad you asked the question. I read through the posts to see if there was anything explaining what there would be to veto and I sure didn’t see anything so I don’t know what they’re talking about. Congress — America’s number one domestic enemy. If it comes to that, hopefully, Congress won’t be able to override that veto. It’s a certainty that they will try. God does not exist. Religion in science is an absurdity, in practice an immorality and in men a disease. As the past century was the century of capitalist power, the twentieth century is the century of power and glory of labor. When the war is over, in the worlds social revolution that will be followed by a more equitable distribution of the earths riches, due account must be kept of the sacrifices and of the discipline maintained by the Italian workers. As can be seen, fascistic rhetoric is no different from communistic rhetoric. I guess the Dems in the House could pass such a Resolution, but I suspect Mitch will never let it see the light of day in the Senate. Congress can't pass a law removing the specific authority that President Trump used in order to stop him, because that would be an ex post facto law. They can only remove the authority from future use. That can be vetoed, and that veto can be overridden. If Mitch does, he will have Trump supporters at his doorstep! This veto would be upheld. There are not 2/3 in either house to override a Dec of Emergency. Now, had he vetoed the BUDGET, yes, that would have been overridden. We need a viable labor party. And I don’t mean a union run labor party. Just a party of workers that believe in MAGA and think all immigration should stop for decades while we try to assimilate the ones we have..
Just different flavors of Totalitarianism.